Delightful sunbeam P.K. 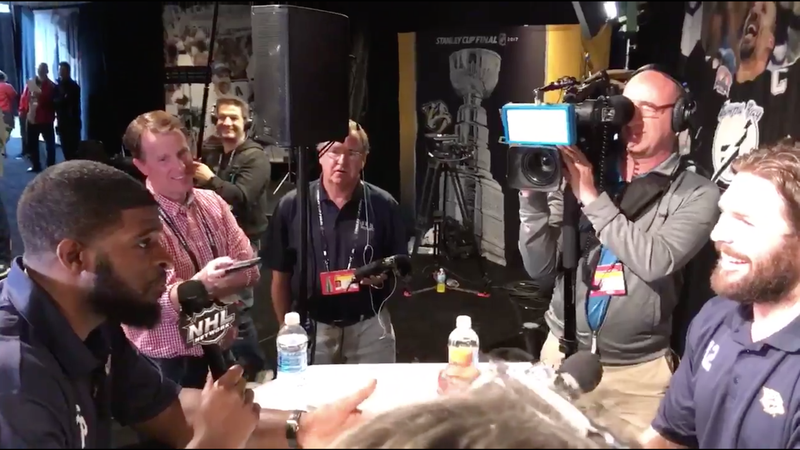 Subban decided to turn the tables during today’s media day for the Stanley Cup Final, abandoning his spot taking a questions to grab a microphone and grill his teammates on the tough questions no one else dares to. For instance—Mike Fisher, just how it does it feel to be so damn good-looking? It’s very, very easy for this sort of thing to come off as kitschy or cloying or simply trying too hard. (Especially given the fact that Subban has done this before—though he improved this time, no statement-masquerading-as-question here!) But you know what? Subban is so pure, so genuine, so simply fun that he kind of makes it work. Report on.